Suggesting rampant trafficking, the latest National Crime Records Bureau (NCRB) data shows that minor girls are twice as likely to go missing than minor boys. According to the NCRB report for 2016, 60 per cent of the total missing people were females — about 24 per cent of these were girls (below 18 years), while 74 per cent were in the 18-60 years age group. 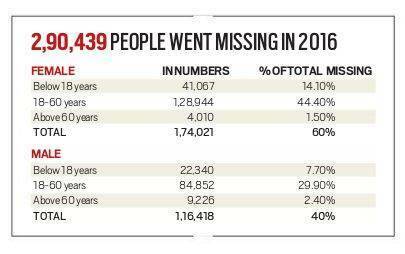 This is the first time that NCRB has collated data on missing people across the country. While a total of 22,340 minor boys (below 18 years) went missing in 2016, the corresponding figure for girls was almost double at 41,067. In the 18-60 years age group, 84,852 men and 1,28,944 women went missing. According to the data, 19 per cent of the total missing males were minor boys, and 60 per cent were in the 18-60 years age group. In overall data, however, under-18 boys account for 7.7 per cent of the total missing people, while under-18 girls add up to 14.1 per cent. Women between 18-60 years of age account for 44.4 per cent of all missing, while men in that age group add up to 29.9 per cent. But in the case of senior citizens, more men (9,266) went missing than women (4,010). According to the NCRB data, a total of 2.90 lakh people went missing in 2016. Of these, about 1.74 lakh were females. The pattern points to trafficking of women and girls. A total of 5,087 cases of human trafficking and prostitution involving 7,561 women and girls were registered, according to the NCRB. “The math is very simple. From our case work of nearly a decade, we have found that mostly minor girls, particularly in the age bracket of 15-18 years, are trafficked in high numbers,” said Adrian Phillips, advocate and spokesperson, Justice and Care, an anti-trafficking NGO with a pan-India presence. According to the data, in the beginning of 2016, the number of missing people from the previous years stood at 2,58,569. With another 2,90,439 reported missing in 2016, the total figure stood at 5,49,008 (2,34,334 males and 3,14,674 females). The authorities, however, managed to trace 2,29,381 missing people through the year. Maharashtra reported the maximum missing cases (94,919, including 49,338 females), followed by West Bengal (85,855, including 53,654 females) and Madhya Pradesh (59,660, including 39,375 females). Similarly, a total of 1,11,569 children (pending cases from previous years and new cases in 2016) were reported missing, of which 41,175 were boys and 70,394 girls. West Bengal topped the list (16,881 children; 4,595 boys, 12,286 girls), followed by Delhi (14,661 children; 6,125 boys, 8,536 girls), and Madhya Pradesh (12,068 children; 3,446 boys and 8,622 girls. Of the total missing children, 55,944 (20,364 boys and 35,580 girls) were traced.